Three headlines about plant viruses caught my eye this past month, although there certainly are more stories out there. There are no chemical sprays or “cures” for plant virus diseases (prevention is key). Bottom line, plant viruses can cause loss in crop quality and yield. Nearly 7 million bats – and counting – have succumbed to a fungus that has been spreading throughout the eastern U.S.
White nose syndrome, named for the visible white fungal growth on the noses of affected bats, has spread throughout the eastern U.S., including Ohio. First documented in eastern New York in 2007, the fungus appears to infect hibernating bats, with a mortality rates 90 to 100%. The fungus is believed to be an introduced species, in part because North American bat populations seem to have very low levels of immunity, or genetic resistance. 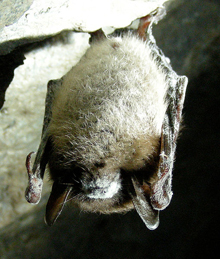 In contrast, European bat species and the white nose fungus appear to have evolved over time to co-exist. In addition to tremendous ecological ramifications, impacts include economic losses (estimated losses in agriculture: billions), public health (bats eat mosquitoes and other insects that may vector disease), and loss of tourism (cave tours and hiking contribute millions of dollars into area economies > here’s an example). Working with the unknown – even in this day and age – presents several challenges. Recent research at the University of Akron is helping put together some of the puzzle pieces. Hannah Reynolds, lead author on this study featured in Science Daily, is currently a postdoctoral researcher in the Department of Plant Pathology. 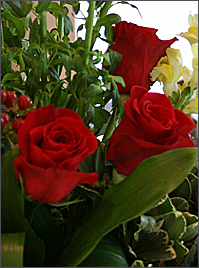 Valentine’s Day: Think Flowers . . .
Valentine’s Day is a busy time for many businesses, but an article from Our Amazing Planet (LiveScience) reminds us that it’s also a busy time for the U.S. Customs and Border Patrol. You might be surprised to learn that most cut flowers in the U.S. are imported, largely from South and Central America, and that Miami is the point of entry for the bulk of fresh cut flower shipments. Inspectors serve as an important line of defense, examining incoming plant shipments for pests and disease pathogens. If something harmful should hitchhike its way into the U.S., it could establish a new “home” here and damage crops and animals as well as the environment. In the U.S. alone, invasive species have an economic impact upwards of $100 billion (USDA).
. . . When a tree is pruned, does it suffer? This was the question posted in the NY Times Science Q&A on Dec. 23. My quick answer: no . . . plants don’t have nerves or a central nervous system associated with what we think of as “pain”. As Amy Litt pointed out in the NY Times article, however, plants do mount a response to injury (e.g. pruning of a limb), insect attack or pathogen infection. This is an important and active area of research that’s important to plant pathologists in the development stress-tolerant, disease and pest-resistant crops. Related video > Can Plants Think?